Compare the Average Cost of a Mound vs Conventional Septic System - How Much Does Septic System Installation Cost in 2019? Mound septic systems are considerably more expensive than conventional septics because they require more sophisticated construction. The cost of the electric pump and sand also contributes to the total price. 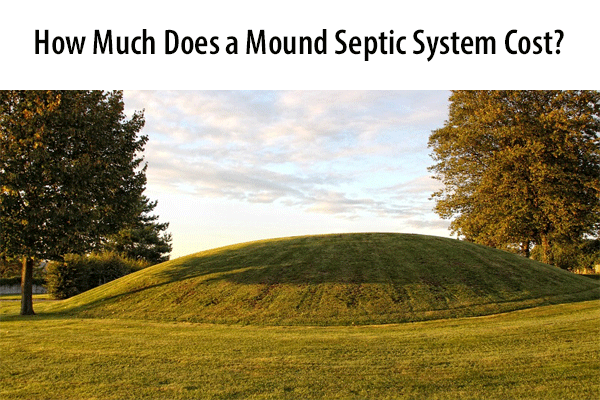 Mound septic systems have an average cost between $10,000 and $20,000. Conventional septic systems come at a lower price, averaging between $3,000 and $15,000. A mound septic system has an average cost between $10,000 and $20,000, but may cost more for exceptionally large systems. It is important to regularly maintain the septic system, with annual maintenance and pumping having an average cost of $500. Conventional septic systems cost less than mound systems, but prices still depend on system size, soil conditions, and your location. You typically need a permit before a septic system is installed, which has an average cost between $250 and $1,000. Location really does affect pricing. A conventional septic system has an average cost between $2,000 and $5,000 in the Midwest, but may cost between $4,000 and $15,000 in areas where labor and material costs are higher. A septic tank on its own has an average cost between $500 and $1,800 depending on its size. Piping and other materials have an average cost between $100 and $200. Inspections are required every one to three years, at an average cost between $200 and $600. The system must also be pumped periodically, which costs between $200 and $400. A conventional septic system is comprised of a tank and a drain field. Liquid waste separates from solid waste in the tank, then moves into the drain field and filters into the soil. There are advantages and disadvantages to conventional systems. 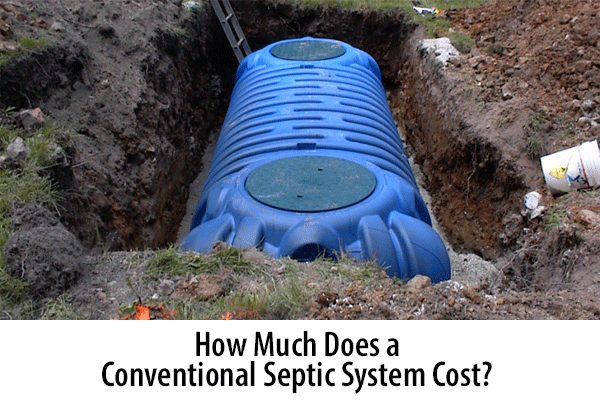 Cost: Conventional septic systems have a much lower price in comparison to mound systems. Eco-friendly: Conventional systems use no chemicals or power-source to break down waste, making them better for the environment. Variety: There are different types of conventional systems to choose from, such as aerobic, concrete, fiberglass, and stainless steel septic systems. This gives you the ability to choose the best possible system for your needs. Backup: Sewage backup causes real issues in the home (not to mention the smell), affecting everything from toilets, to sinks, to showers. Leaks and ruptures: As soon as you notice any issues with leaks or busted pipes, you need to act on it. It causes major issues for your septic system and can cause costly property damage. Digging and roots are common causes of ruptured pipes. Rust: The piping of conventional systems is susceptible to rust if not properly maintained. If your pipes become corroded, they may collapse and cause the septic system to leak. Mound septic systems involve making an above-ground pile of gravel or sand to hide the system. This places the system's absorption area above ground, requiring an electric pump to bring waste to the mound for treatment. Just as with conventional systems, mound septic systems come with advantages and disadvantages. Climate: Mound systems work well in moist climates, experiencing fewer issues in comparison to conventional systems. Construction: When done properly, mound septic systems cause minimal damage to the yard, as little excavation is needed. Discharge: Mound systems do not directly discharge liquid waste into a ditch, hole, or body of water. Cost: Though construction is less damaging, it does tend to cost more than conventional installation. The cost of the systems themselves are also higher. Land use: Mound septic systems often affect drainage patterns and limit land use, requiring pumps and siphons to work properly. Rebuilding: Any amount of leaking or seepage could mean partially or fully rebuilding the mound. There are numerous types of septic system choices beyond mound vs conventional. For example, you need to choose between aerobic and anaerobic, which refers to the type of bacteria used to break down waste. No matter which type you choose, you must have your septic system inspected and pumped by a professional. How often depends on the size of the tank and the amount of waste you need it to handle. On average, though, you should have your septic tank pumped every two to three years.